Did you know that Salsa dancing uses embodied leadership skills? Embodied leadership is the ability to use your whole body, mind, heart, gestures and words, all in sync to powerfully communicate your message. Dancing forces us to focus on the less practiced method of using our body, energy and presence (without words) to communicate or lead our message. Horses give us immediate authentic feedback on our presence, energy and leadership. That’s why combining the three areas of Dancing, Horses and Leadership work so well. Workshops are designed to make you feel at ease, while also pushing you to further your interpersonal and leadership skill set. The blend of dancing and horse work teaches you valuable leadership and followship skills – regardless of your experience in either! A highly informative and life changing experience. So want to learn about yourself and your leadership style while stepping outside of the classroom? Then come and experience Leadership Transformation with ‘Dancing with Horses’. 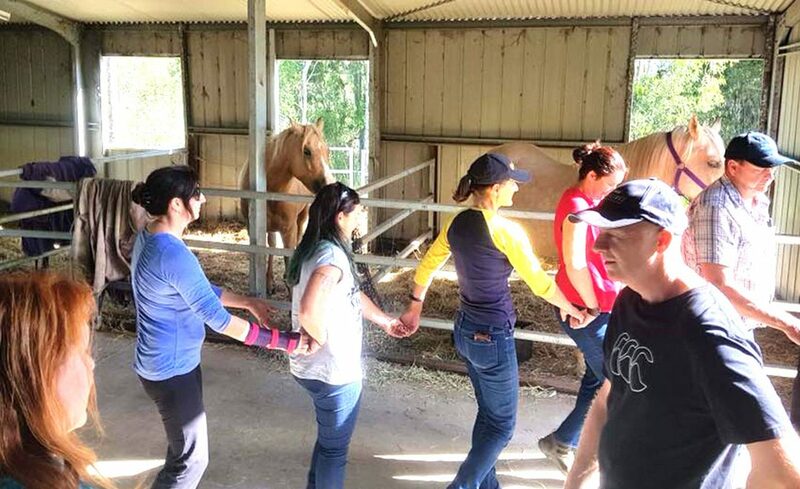 It’s a wonderful opportunity to learn about yourself, how to lead and follow, connect, create partnerships using the lens of dance and with the assistance of our wonderful equine facilitators. In a relaxed and friendly environment, with small intimate groups, and using effective practical experiential learning. Fiona is an inspiration and born leader – the information and teaching method she presented was unlike anything I’d experienced in the past and I came out learning more about myself and my style of leadership.